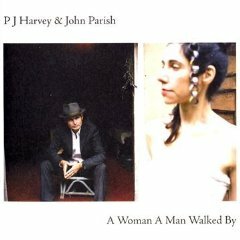 PJ Harvey may be the high-profile name that draws most music fans to A Woman a Man Walked By, but the friendship that binds her to John Parish runs deep. Long before her debut Dry caught the attention of alt-rock fans everywhere, Harvey was cutting her teeth as a member of his outfit Automatic Dlamani. Most artists who become critical successes never look back. Harvey, on the other hand, hasn’t forgotten her roots. She and Parish may have an on-again, off-again relationship in the studio, but they nevertheless have crossed paths quite frequently over the years. In fact, it’s safe to say that, by providing a safe place for her to explore her bent and twisted ideas, he has become the touchstone to which she repeatedly returns. Dance Hall at Louse Point, the collaboration on which Parish first shared equal billing with Harvey, largely is considered a curiosity in her canon, yet it also firmly established the notion that they were in this together. In order to craft her 2007 set White Chalk, Harvey learned to play the piano, and with Parish by her side, she used the instrument to frame the creepy overtures that filled the endeavor. For their latest project A Woman a Man Walked By, the duo returned to the formula they previously had employed on Dance Hall at Louse Point. That is, Parish wrote and performed the music, while Harvey penned and sang the lyrics. Not surprisingly, there are some parallels to be drawn between the way Kevin Shields gave life to Patti Smith’s poetry on The Coral Sea and how Parish paints cinematic flourishes upon Harvey’s material on A Woman a Man Walked By. Aside from its opening track Black Hearted Love, the song that served as the impetus for the collection, there’s nothing even remotely commercial about the outing. In fact, the album is, perhaps, the strangest effort in Harvey’s canon. Unlike Harvey’s previous endeavors, which sometimes have confined themselves to exploring specific sonic spaces, A Woman a Man Walked By is, musically speaking, all over the map. Throughout the set, moments of severe agitation and angst are juxtaposed with sad, mournful pleas. Sixteen, Fifteen, Fourteen is appropriated from Led Zeppelin’s forays into the constructs of acoustic blues, while the crash-and-burn fury of Pig Will Not stands as its polar opposite. The choppy, rhythmic undertow of The Chair animates the song’s inherent drama, and the angry squalls of a guitar that burst from the dark and moody Black Hearted Love set the stage for everything that follows. A Woman a Man Walked By might not be a concept album, per se, but there certainly are times when it feels like one. Stalked by death and grief, the collection seems to trace a narrative arc that outlines a tragic loss and its immediate aftermath. The game between Erika and Daniel in Sixteen, Fifteen, Fourteen, for example, bears ominous overtones before tumbling into the desolate, drifting ambience of Leaving California. During The Chair, a mother mourns the loss of her son, who has drowned. Perhaps, not so coincidentally, his name is Daniel. The lyrics that Harvey penned for A Woman a Man Walked By don’t always follow the tale completely. Whenever they deviate from the storyline, however, the music assumes control and carries the plot forward. Paired with the instrumental interlude The Crow Knows Where All the Little Children Go, the title track regains the album’s focus by evoking the madness and obsession that flow from the traumatic breakdown of a grief-stricken mind. Elsewhere, the funereal procession of Passionless Pointless is combined with the emptiness of Cracks in the Canvas to conclude the narrative while leaving the conjured emotions hanging hauntingly in the air. A Woman a Man Walked By is available from Barnes & Noble.